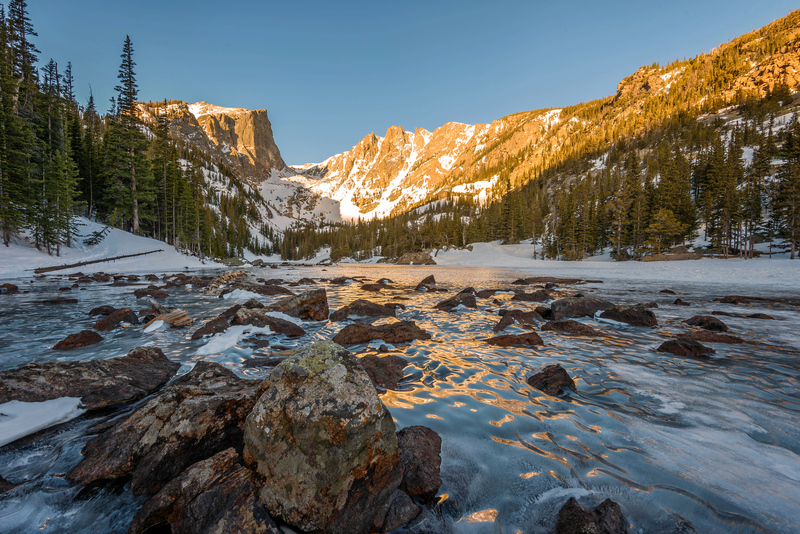 I spent a cold morning taking pictures of Hallett’s Peak over Dream Lake. As the sun rose and the late morning hikers gathered I started my descent down the trail. On my way down I gazed over at Long’s Peak and noticed the unique cloud formation building above it. I unpacked my camera gear and waited a few minutes as the clouds passed over top of the highest mountain in Boulder County (rising to 14,259 feet). I’m not sure what kind of cloud it is – does anyone have any ideas? I thought it was lenticular at first but think those build vertical up through the sky and these clouds seemed pretty flat. I came down with a pretty nasty cold last week that took me out of commission for a few days. I’m finally feeling a bit better today which is good because I’ve got a bunch of travel coming up the next three weeks. No personal trips mixed in there though so will have to keep drumming up old travel photos like this one from Rocky Mountain National Park during the summer of 2014. I was with my wife vacationing after a business meeting and woke up one morning to make the 3.5 mile round-trip hike to Emerald Lake. The easily accessible trailhead, Bear Lake Trailhead – the busiest in the park, is often over crowded by 10 AM so if you plan on going hiking here be sure to get there early or just plan on parking in one of the remote parking areas and taking the shuttle to the trailhead. Alternatively, you can hike to this spot by adding some distance if you start at the Bierstedt Lake Trailhead. The trail is well maintained and takes you by two other lakes – Nymph Lake and Dream Lake – as it winds through pine and aspen trees. I scouted this location out the day before when my wife and I hiked up to this spot. I envisioned framing the shot with this funky looking dead tree anchoring the foreground. If there were only a few more colorful clouds in the sky this shot would have been perfect but the clouds weren’t picking up the sun the same way the peaks of the mountain were. Often overlooked as a photographic spot is ‘Storm’s Pass’ on Bear Lake Road which offers nice views of Hallett Peak at sunrise. Storm’s Pass has a tiny parking lot that fits maybe four cars and it is surrounded by much more popular destinations along Bear Lake Road – like Bear Lake itself, Glacier Gorge, Sprague Lake, etc… all of which draw hundreds of hikers and photographers daily. As I sat here photographing cars flew by but not a single person stopped to catch the view. There is a river leading down from the mountain which draws a leading line through the trees which also help to provide a nice foreground. The only negatives are the two trees that have jumped up and partially blocked the views of the mountain….if only I had a saw (just kidding of course). There are a ton of elk/deer in Rocky Mountain National Park and on my last trip there I spent an hour or so watching a herd of them near the Fall River entrance station near the Sheep Lakes. I kept a respectable distance but was able to get reasonably close to them as I walked a wide circle from the main road and came up behind them next to the lake they were drinking out of. We are off to the Smoky Mountains this week on Wednesday for a few days and hoping to see some good fall color. To my surprise this is the most popular time of year in the Smokies (I figured it’d be summer) so everyone must be as interested in the fall leaves as I am. I’m on a crazy travel schedule this week as I’ll be on planes all week long. I’m starting the week in Dallas before going to Los Angeles then back to Dallas then up to Calgary and finally back to Chicago (via Los Angeles on an overnight flight) so I can get home Friday morning before my family from Michigan comes to visit. I was supposed to run the half marathon this weekend but had to cut my training short because of foot and ankle problems in both feet. I’m resting until March and then will start to run again…it’s going to be a long, brutal winter but I was really having problems walking because of the pain so it is a necessary rest.